Global meat production has tripled in the past three decades and could double its present level by 2050, according to a new report on the livestock industry by an international team of scientists and policy experts. 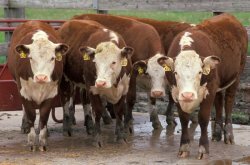 The impact of this "livestock revolution" is likely to have significant consequences for human health, the environment and the global economy, the authors conclude. "The livestock industry is massive and growing," said Harold A. Mooney, co-editor of the two-volume report, Livestock in a Changing Landscape (Island Press). Mooney is a professor of biology and senior fellow at the Woods Institute for the Environment. "This is the first time that we've looked at the social, economic, health and environmental impacts of livestock in an integrated way and presented solutions for reducing the detrimental effects of the industry and enhancing its positive attributes," he said. -More than 1.7 billion animals are used in livestock production worldwide and occupy more than one-fourth of the Earth's land. -Production of animal feed consumes about one-third of total arable land. -Livestock production accounts for approximately 40 percent of the global agricultural gross domestic product. -The livestock sector, including feed production and transport, is responsible for about 18 percent of all greenhouse gas emissions worldwide. Although about 1 billion poor people worldwide derive at least some part of their livelihood from domesticated animals, the rapid growth of commercialized industrial livestock has reduced employment opportunities for many, according to the report. In developing countries, such as India and China, large-scale industrial production has displaced many small, rural producers, who are under additional pressure from health authorities to meet the food safety standards that a globalized marketplace requires. Beef, poultry, pork and other meat products provide one-third of humanity's protein intake, but the impact on nutrition across the globe is highly variable, according to the report. "Too much animal-based protein is not good for human diets, while too little is a problem for those on a protein-starved diet, as happens in many developing countries," Mooney noted. While overconsumption of animal-source foods – particularly meat, milk and eggs – has been linked to heart disease and other chronic conditions, these foods remain a vital source of protein and nutrient nutrition throughout the developing world, the report said. The authors cited a recent study of Kenyan children that found a positive association between meat intake and physical growth, cognitive function and school performance. Human health also is affected by pathogens and harmful substances transmitted by livestock, the authors said. Emerging diseases, such as highly pathogenic avian influenza, are closely linked to changes in the livestock production but are more difficult to trace and combat in the newly globalized marketplace, they said. The livestock sector is a major environmental polluter, the authors said, noting that much of the world's pastureland has been degraded by grazing or feed production, and that many forests have been clear-cut to make way for additional farmland. Feed production also requires intensive use of water, fertilizer, pesticides and fossil fuels, added co-editor Henning Steinfeld of the United Nations Food and Agriculture Organization (FAO). The beef, pork and poultry industries also emit large amounts of carbon dioxide, methane and other greenhouse gases, Steinfeld said, adding that climate-change issues related to livestock remain largely unaddressed. "Without a change in current practices, the intensive increases in projected livestock production systems will double the current environmental burden and will contribute to large-scale ecosystem degradation unless appropriate measures are taken," he said. "We want to protect those on the margins who are dependent on a handful of livestock for their livelihood," Mooney said. "On the other side, we want people engaged in the livestock industry to look closely at the report and determine what improvements they can make." But calculating the true cost of meat production is a daunting task, Mooney added. Consider the piece of ham on your breakfast plate, and where it came from before landing on your grocery shelf. First, take into account the amount of land used to rear the pig. Then factor in all the land, water and fertilizer used to grow the grain to feed the pig and the associated pollution that results. Finally, consider that while the ham may have come from Denmark, where there are twice as many pigs as people, the grain to feed the animal was likely grown in Brazil, where rainforests are constantly being cleared to grow more soybeans, a major source of pig feed. "So much of the problem comes down to the individual consumer," said co-editor Fritz Schneider of the Swiss College of Agriculture (SHL). "People aren't going to stop eating meat, but I am always hopeful that as people learn more, they do change their behavior. If they are informed that they do have choices to help build a more sustainable and equitable world, they can make better choices."